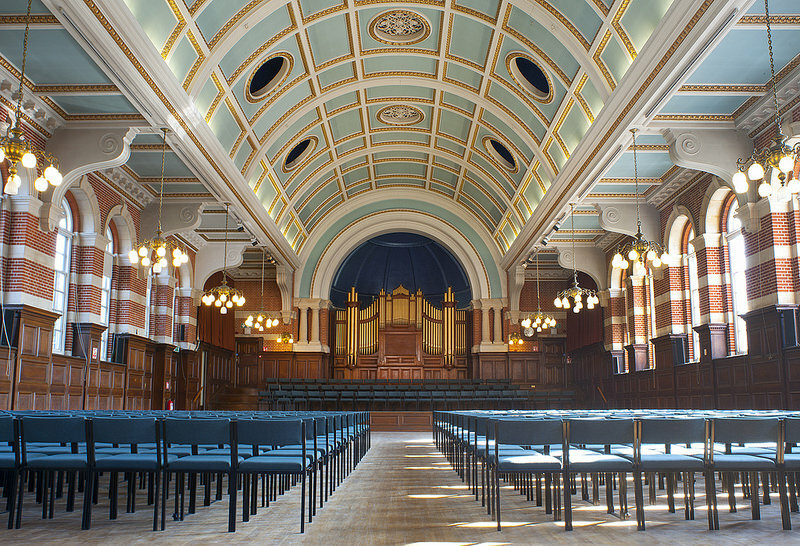 The Great Hall at University of Reading is a Grade II listed heritage building, and the main venue on campus for events such as graduation ceremonies and other public events. However, the building dates back to a period before the advent of AV technology of any kind. The architectural attributes, such as the hall’s 80-foot (25 meter) curved ceiling, have long posed acoustic distortions during public events. Particularly problematic was spoken word intelligibility (the large open space allowed sound to reverberate beyond control, rendering spoken words through the sound system unintelligible); a common complaint received from users of the space. To address the problem, the Vice-Chancellor engaged Snelling Business Systems and specialist audio distributors POLARaudio. However, in finding a solution lay another challenge- negligible scope for compromise on the building’s protected historic status and period character. How can we overcome the hall’s acoustic dispersal challenges, particularly to increase spoken-word intelligibility and reduce echo, without making any structural changes to the architecture (such as the high curved ceiling). While focus was on improving spoken voice reinforcement and musical playback on occasions in a highly reverberant space, all upgraded hardware had to be, without any compromise, discreet in order to sympathetically blend with its surroundings. The problem lay with sound waves bouncing off far more than necessary in a large open space with a high curved ceiling. 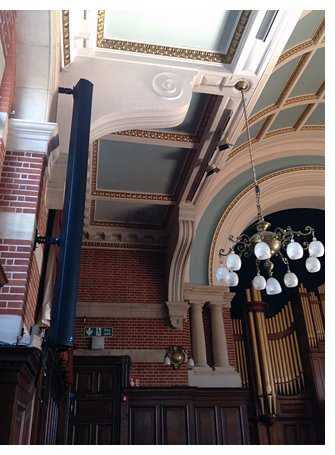 With the lack of flexibility in changing the architecture or acoustic-proofing, we found a solution in Digitally Steerable Line Array; tailored to the Great Hall. The ICONYX IC-24 speakers from industry leaders in Line Array technology, Renkus Heinz, were the final solution. 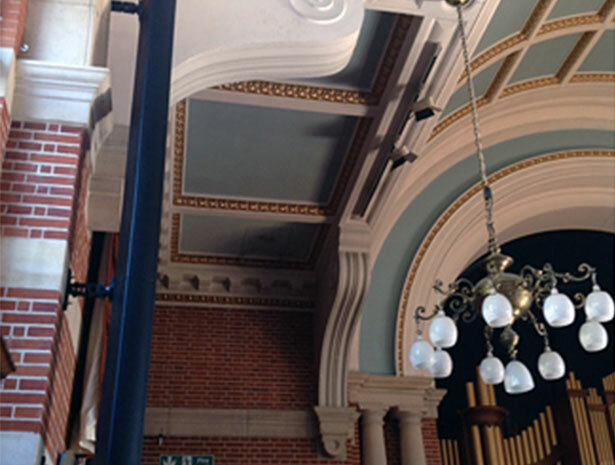 Supplied by POLARaudio, these create channelled beams of sound which can be forcefully directed towards the audience for an even coverage of intelligible sound, whilst steering away from the hard reflective surfaces of the space (such as the curved ceiling) to minimise reverberance. Keeping in mind the size of the Great Hall and its capacity, the ICONYX series was used for its flexibility and range, with sizes from the IC-8 (smallest) to the IC-32 (largest). As the speaker length increases, so does its ability to more sharply focus the audio on a listening area and ‘throw’ over a far greater distance. Discreet: To blend with the stunning architecture of the hall, IC-24s were also the ideal solution. The ICONYX enclosure is designed to be heard but not seen, mounting flush to walls and columns and custom-coloured to blend invisibly with the surroundings. The signal processing needs were met with a Biamp Nexia SP in conjunction with a Mackie VLZ4 1202 12-channel mixer and Beyerdynamic microphones. In order to cater for occasional music playback, a pair of AD-Systems i.Flex15BHP bass reflex speakers were installed, along with a Flex 8 full-range speaker for onstage monitoring (powered by Australian Monitor AMIS250P). This system was designed to be fully portable (removed and stored when not in use). Learn more about the Great Hall commission. Download the casebook.